Entrepreneurs who’ve tried to tap the energy of ocean currents have typically failed because the currents are so powerful that they eventually destroy most systems relying on turbines and other moving parts. 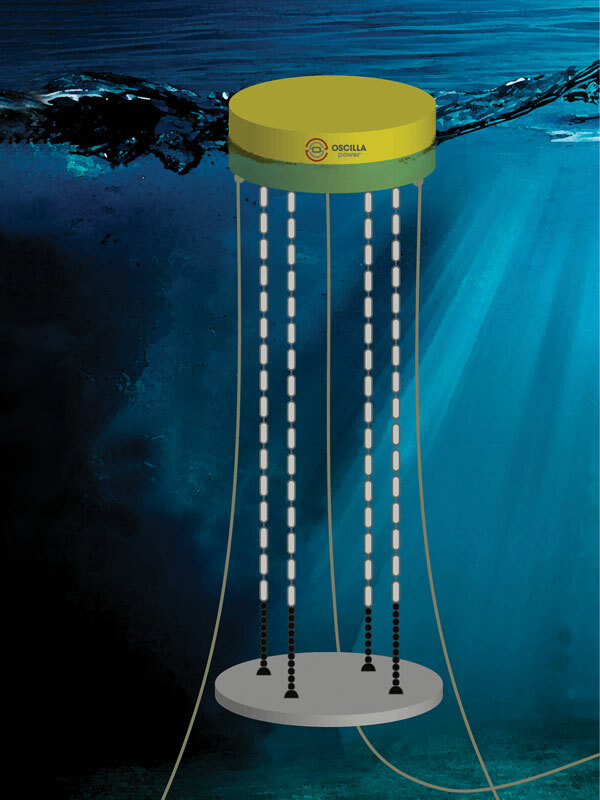 Seattle-based Oscilla Power Inc. thinks its “wave energy harvesters” have solved the problem. A chain of low-cost iron-aluminum rods are tethered to a large buoy and anchored to a heavy plate. As the rods are stretched and compressed by ocean movement, they create an electromagnetic phenomenon known as magnetostriction, which is captured by conventional coils wrapped around the rods. This “magnetostriction power generator” transfers the mechanical energy into electricity that is delivered by traditional cable transmission to the onshore grid. Oscilla Power was launched in 2009 after metallurgist Balakrishnan Nair, now the company’s CTO, tank tested his ideas at the University of California–Berkeley. Since then, Oscilla has tested the system in increasingly more challenging locations. A one-quarter-scale generator recently was pulled from the water after a successful test this summer six miles off the New England coast. Oscilla CEO Rahul Shendure says testing of a commercial-scale system is set for 2017-18. He expects the system to produce power at a cost of 5 to 10 cents per kilowatt-hour. Traditional hydroelectric and fossil fuel systems cost roughly 8 cents in the United States, while alternative energy methods can cost 17 cents. The company has received $6 million in funding from private and public sources, including the National Oceanic and Atmospheric Administration, the U.S. Department of Energy and the National Science Foundation. Academic partners include the University of Washington and the University of New Hampshire. The company says it will need to raise an additional $15 million to $20 million for full-scale commercial testing. Shendure is optimistic because the absence of moving parts means fewer maintenance expenses while the inexpensive alloys used for rods will keep material costs down. Oscilla hopes to use the Pacific Marine Energy Center, now in development near Newport, Oregon, for its commercial test. The facility will be operated by Oregon State University researchers as the first utility-scale, grid-connected wave energy test site in the United States.